There was really no family memory of having relatives in New York, but since I’ve moved here I find them fairly often. 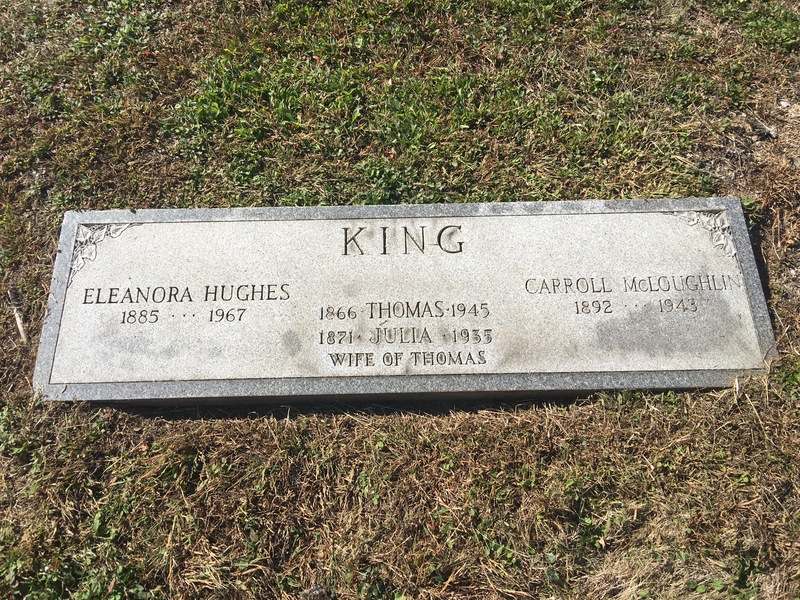 I’ve known for awhile that my great-grandfather’s sister Julia Hegarty King (1869-1935) is buried on Staten Island. She turned up in a New York death index on Ancestry.com and I sent away for her death certificate. Today I took advantage of the glorious fall weather and drove out to Ocean View Cemetery to see her gravesite. Julia shaved a few years off her age once she got to the United States. So there she is with her husband Thomas. Carroll McLoughlin was Julia’s son-in-law. 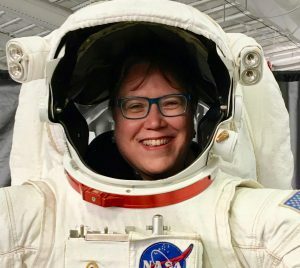 The surprise bonus of going out there is the discovery that Eleanora (Hegarty) Hughes is there too: she’s Julia’s sister and another great-great-aunt. I didn’t even have a death date for her until now. In Massachusetts, my Hegarty relatives are mostly concentrated in the Cambridge/Somerville area of Middlesex County. I’ve long wondered why my great-grandfather chose that particular area. Today I found one possible reason: he had an uncle already living there. (Most immigration happens in chains; people go where they already know someone.) Since I pushed back that next generation, I’ve been able to better identify which Hegartys are mine. 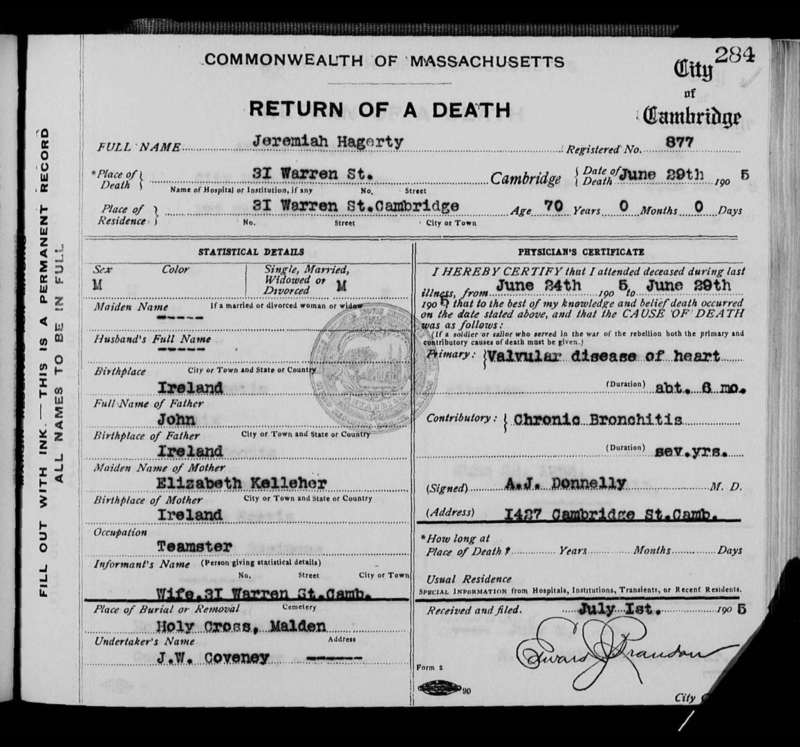 The FamilySearch matching engine brought forth a Massachusetts death certificate for a 3X great-uncle Jeremiah Hegarty, who died in Cambridge in 1905. He was the uncle of the women buried above and of my great-grandfather. So that’s who my great-grandfather knew in Cambridge. I suppose the next question is about who Jerry knew, but I need to actually work on things for my job for a while now. This month another couple of million of Irish civil registration records were placed online at irishgenealogy.ie, an Irish government website. Of course I checked if there were any new Hegarty records. I found a Daniel Hegarty of Brandy Lane in Cork, husband of Margaret Riordan, registering the birth of his son John Hegarty in January 1867. I remembered that a Daniel Hegarty of Brandy Lane was the informant on the birth certificate of my great-grandfather John Hegarty of Gillabbey Lane, Cork in December 1867. My theory is that Daniel was the informant for his nephew; that my great-great-grandfather Michael Hegarty of Gillabbey Lane was Daniel’s brother. I know that Michael’s father’s name was John because it was given in Michael’s marriage record to Ellen Cronin. I searched the parish sacramental registers that are also online at the same website, and found a marriage for Daniel Hegarty and Margaret Riordan in February 1858 in Kilmurry, Co. Cork. I searched all the parish baptisms for a John Hegarty with sons named Daniel and Michael, who would be the right age to be having children in the 1860s, and sure enough he turned up in Kilmurry with his wife Eliza Kelleher. Between 1829 and 1845, John and Eliza (Kelleher) Hegarty had seven children: Daniel, Jeremiah, Ned, Ellen, John, Michael, and Patrick. John Hegarty is also listed as a tenant in Kilmurry in Griffith’s Valuation in 1853. Therefore, I’m adding John Hegarty and Eliza Kelleher as my great-great-great-grandparents. I also found a 1796 baptismal record for a John Hegarty in Kilmurry, the son of Michael Hegarty and Mary Donnelly. It’s only one piece of evidence but I’m adding them for now as 4th-great-grandparents; it’s not like evidence is thick on the ground for this period. So it’s worth checking out the updated Irish civil registrations site if you haven’t already. They took me back one solid generation and one more pretty good possibility. This is the second part of my August trip to Newfoundland. First part is here. We flew on Monday in a tiny propeller plane from Deer Lake to St. John’s to avoid the long driving slog across the island. We rented a car at the airport and drove to Harbour Grace, a former second city that has hollowed out due to job loss. Harbour Grace is also where my maternal grandmother was born. We stayed two nights at the super comfortable Rose Manor Inn. We hung out there a little more than I normally would on a trip because there is not a lot to do in this area. Fortunately, they have adirondack chairs looking out over the harbor and these were a peaceful two days. We walked around and explored the Conception Bay Museum and the Harbour Grace visitors’ center. These are staffed by polite, charming, but very bored teenagers who obtained summer work grants from the government. There was a sort of palpable sense of “OMG why would anyone want to look at this old stuff? !” It was equally interesting to talk to them and hear what their plans were. We had a couple of beers at the almost deserted bar of the Hotel Harbour Grace, where there were just us and a few locals playing the video slot machines. We ate dinner both nights at the Rose Manor Inn because there literally were not any other restaurants open in the area. Fortunately the Inn’s dinners are fancy and delicious. The Conception Bay Museum features this figure of pirate captain Peter Easton, who had a pirate fort in Harbour Grace in the early 1600s. Shipbuilding. Lots of model ships about too. The now decommissioned Cathedral of the Immaculate Conception. On Tuesday, we drove to Harbour Main. We visited Sts. Peter and Paul Roman Catholic church and looked at the house where my maternal grandfather was born. (We didn’t knock, so I don’t know who’s living there now.) Finally, we drove up a dirt lane and into someone’s back yard to visit the old “Irish” cemetery where my great-great-great-grandfather Vincent Costigan from Co. Tipperary is buried. We had lunch afterwards at Crooked Phil’s in Carbonear which served the platonic ideal of a ham sandwich and curried chicken soup. Sts. Peter & Pauls. The vaulted ceilings reminded me so much of boats’ keels. Costigan house where my grandfather was born. On Wednesday, we went back to St. John’s and visited The Rooms. There was a very moving exhibit focusing on the 100th anniversary of the Beaumont-Hamel offensive in the Battle of the Somme, where the Newfoundland Regiment had an 85% casualty rate. I am not a military history person but this exhibit was amazing. They even had an area devoted to the keepsake photos that soldiers took before they left, including the original camera from the main photo studio. I have one of those photos from my family history files. The Rooms has an online exhibit about Newfoundland and WWI. The whole museum was great. There was an exhibit about the influence of Irish culture and I learned that Waterford crystal was founded with money made in Newfoundland and was extremely popular in Newfoundland. I had never realized that my mother’s and grandmother’s fierce brand loyalty to Waterford crystal had any connection to their Newfoundland roots. We had a great lunch (crab cakes and salad) in the museum cafe, which has amazing views of the harbor. After The Rooms, we returned the rental car and checked into the Quality Hotel in St. John’s, which was conveniently located downtown. We rested a bit and then embarked on perhaps the most expensive activity of the entire vacation: dinner at super fancy Raymond’s, one of the top ten restaurants in all of Canada. I had the charcuterie platter (shared), the fresh pasta, and the salmon. Also wine and some kind of lemony dessert. It was festive and fantastic. We had drinks beforehand at the The Fifth Ticket where there was a cheerful but inexperienced bartender. Nevertheless, my Blow Me Down Blueberry Mojito was delicious. On Thursday I visited the offices of the Family History Society of Newfoundland and Labrador, where I confirmed that there are no sources I am overlooking and other people are reaching my same conclusions, so I’m not wildly offtrack in my family history research. After that I went to the small Fluvarium, which is basically a wall of windows built into the side of a river so you can watch the wild fish. I have never seen such enthusiastic aquarists as the Fluvarium staff. We had dinner with a friend of my brother’s at Chinched Bistro, more charcuterie and pasta, absolutely delicious. On Friday we ended up walking around downtown because the weather cancelled our whale watching plan. We wandered along the harbor and did some souvenir shopping. We had fish and chips at the Duke of Duckworth pub. We had tea in the crypt of the Anglican Cathedral of St. John the Baptist. We visited the Peter Lewis art gallery which had some terrific abstract pieces by Susan Doyle. In the evening I met up with a potential 4th cousin at Bernard Stanley Gastropub, which serves an excellent cheeseburger. And then vacation was over and I had to return to Brooklyn and the new school year which has prevented me writing this up until now. I loved this trip. The people are friendly, the vibe is very laid-back, the air and water and streets are clean. There are local problems with unemployment and the government seems to be cutting services like libraries and schools. So I can’t really say it’s actually paradise. It seemed obvious that many people make most of their money in the tourist season and survive off that the rest of the year. But a lot of places in New England are like that too. There was not much diversity outside of St. John’s. The high prices were offset by a favorable exchange rate for the US dollar, but that exchange rate could change and has in the past. Most of all, the Canadian government has prioritized tourist services which makes it easy, for the most part, to travel around and see things: there are logical schedules and good signage. I would love to go back and see more of the province and also spend more time in St. John’s. George B. Costigan Sr., who represented Long Beach, L.I., on the Nassau County Board of Supervisors for 14 years, died Saturday in West Palm Beach, Fla., where he had lived in retirement for several years. Mr. Costigan was a charter member of the board of trustees of Nassau Community College at Mitchel Field, where the Costigan Physical Education Complex is named for him. This year’s bizarre genealogy discovery (so far): George B. Costigan (1908-1983) was a charter member of the Nassau Community College Board of Trustees. They named the gym after him. He is also my 2nd cousin once removed (his great-grandfather is my great-great-grandfather). I am not sure how to feel about being even more connected to NCC. I guess with such a distant relationship I can continue to ignore it. Yes, I’ve worked someplace almost twenty years before realizing one of the buildings is named for a relative. I admit I don’t spend much time at the gym. Almost a year ago, I started using Family Tree Maker because I was tired of doing double entries between Ancestry.com and Reunion 10. I downloaded my online tree and then reconciled it with my Reunion 10 database. There were many conflicts and problems. In a way this was good because it forced me to look at what I had. After weeks of work, I was ready to move forward working in FTM and syncing it to Ancestry. I was happy. Then Ancestry announced that it would discontinue FTM. I was not happy. My old Reunion 10 software looked so clunky. And now there was an expensive upgrade to Reunion 11 if I wanted the latest and greatest, and I always do. However, MacFamilyTree capitalized on the FTM kerfuffle by running a special on their mostly praised software, so I bought that for much less than the Reunion upgrade. I finally ponied up and paid for the Reunion 11 upgrade. At least it is familiar and I know how it works. (I’ve used versions of Reunion for at least ten years.) I like that it identifies “islands” of unrelated people in my database. I am having an issue with how it displays images: some of mine show up inside the program with weird pastel artifacts splattered across them. I’ve checked and the actual files aren’t affected, so it doesn’t really matter. There seem to be a lot of new reports but I tend to write my own histories. For the moment I am back to working my way slowly through one family at a time, and back to double entries using Reunion and Ancestry. It’s like I’ve trotted around in a big expensive circle to get back to where I started. I write this out to remind myself to stop software shopping and just research. I’m going to start with the Hegarty line and go from there. This week has been full of genealogy connections though. Today, another Newfoundland researcher messaged me to send along a photo she’d taken of a photo of my Coombs great-great-grandparents. It was so exciting to see them and all the family resemblances! (It’s not my photo and I’m not sure how people feel about sharing it online so I’m not posting it here.) Also, a fourth cousin contacted me on Ancestry about the Costigans. I had privatized my online tree while I was sorting things out but now it’s public again, so I guess I’m back to researching.